Horse racing is the sport of kings and Skybook’s distinguished online racebook is outstanding enough to be fit for such kings. Skybook's online racebook has been specially designed to let you bet horses online with an ease and simplicity even greater than what you would find at the race track. 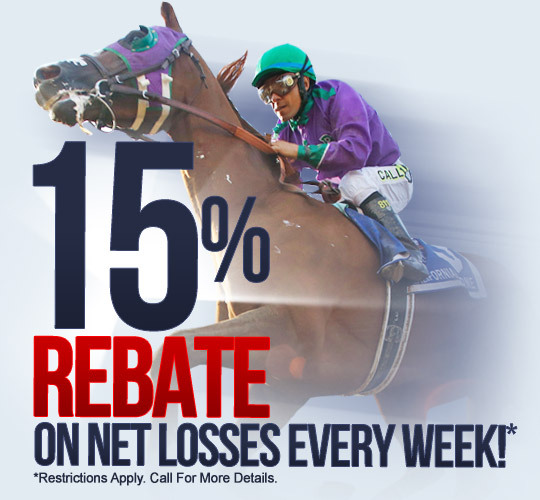 To make things even better we are offering a 15% rebate on weekly net losses; your account will be credited with the 15% rebate on net losses every Monday! The Skybook online racebook allows you to bet on all of the classic races and major tracks. You can bet horses in the Triple Crown (Kentucky Derby, Preakness Stakes, and Belmont Stakes), the Breeders' Cup, and every major horseracing track including Belmont, Aqueduct, Saratoga, Del Mar, Hollywood, Santa Anita, and Churchill Downs. At Skybook's top-notch racebook you can also place a wide range of horse wagers, including straight wagers, exactas, exacta boxes, quinellas, partial wheel exactas, exacta wheels, trifecta, daily doubles, pick 3 and pick 4. The Skybook online racebook pays according to the horse betting odds published by each particular horse track. In other words, you receive the best online horseracing odds available, on par with the horseracing payoff odds established by the top racetracks. Don't just look for likely winners; look for value odds as well. If a horse is heavily backed a few minutes before a race begins and then his odds improve, bet on it. This is a strong indication of insider favorable information about the horse.